So, once the Brits managed to prevent Scotland from departing their own happy Union (barely! ), their confidence boosted by such success has led them to the next logical step – taking the UK and swimming away from the EU. You’d think they would have learned from the Scots, where business and economics (staying in UK) won with national patriotism (departure and creating an Arab-styled oil state with its own currency and immediate large international debt). –	I also wonder who will do the nasty jobs that EU migrants currently do? The lazy unemployed yobos and their 300kg “women” from outskirts of Brummy, Manchester, Glasgow or Bradford? So, we might expect that, at the end, economic rationalities will prevail, although the result will be close – 46-54 or similar. The coolest and most impressive would be aggressive Brebotage – the UK using its strong position to sabotage the current Union. What could the UKs aims be? Of course, while internally, the UK conflict is about electoral politics with the far right ideologies gaining momentum, the overall image is one where Bismarckian Realpolitik is being brought back to the game of INTERNAL EU politics. 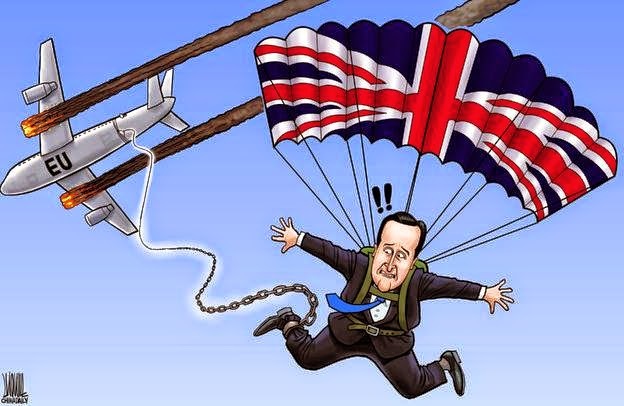 What Putin did from the outside, fooling Brussels and making it look stupid, the UK is not doing from the inside. The interesting question will be – IF Brexit succeeds, are its promoters ready for the consequences? The Chinese have an ancient curse: beware what you wish for.